For their ECE final project, [Adam Papamarcos] and [Kerran Flanagan] implemented a real-time video object tracking system centered around an ATmega644 8-bit microcontroller. 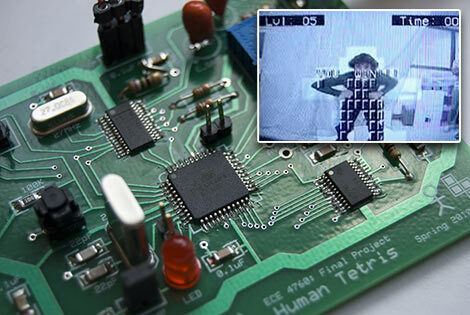 Their board ingests an NTSC video camera feed, samples frames at a coarse 39×60 pixel resolution (sufficient for simple games), processes the input to recognize objects and then drives a TV output using the OSD display chip from a video camera (this chip also recognizes the horizontal and vertical sync pulses from the input video signal, which the CPU uses to synchronize the digitizing step). Pretty amazing work all around. absolutly well done.. one day i will rebuild their board. reminds me of a story i read where workers got replaced by more and more robots over time, with the big jump happening when someone figured out how a earlier 32-bit vision system could be done in 8-bit. So, I’m a bit confused. They call this object ‘tracking,’ but aren’t they just doing black thresholding? Their code seems to suggest so. That’s probably why the guy’s armpit is making the ball bounce in the second video. Well, black thresholding + black object = object tracking. Every object tracking method has to have some sort of logic, it’s just that this one’s logic is fairly simple. Reevaluate your standards – it’s running at 20mHz or lower.